There is always something unique about choral ensembles, transcendental and profoundly humane. Choir performances touch our senses in a very distinct manner, providing an experience that is totally different to the one delivered by all other music formations. Regardless the ensemble’s structure and the repertoire performed, the choir’s main power lies in the human voice being the most natural musical medium, the least contaminated by technology. And with today’s world having very little to do with beauty and harmony, the choirs remind us that those universal values – the pursuit of which is at the heart of our life’s mission – are still attainable by humankind, through music. The world of choirs is as rich as it is fascinating and fulfilling for the senses. In Egypt – and, as it turns out, in the Middle East – there is no shortage of choral ensembles. In Egypt alone there are numerous choirs operating under the Cairo Opera House, from the Cairo Opera Choir and the A Cappella Choir to the Arabic ensembles. There is also the Bibliotheca Alexandrina Choir and BA Children’s Choir, linked to educational institutions such as the Cairo Choir Society, which operates under the American University in Cairo, and the Upper Egypt Children’s Choir, which brings together young people and children from the south of Egypt. We have the Egypt Choir, made up of orphans and homeless children, as well as numerous community choirs such as Arax, an Armenian community choir, as well as dozens of choral ensembles scattered across Egypt’s churches. This brings us to the Cairo Celebration Choir (CCC), the brainchild of conductor and composer Nayer Nagui and one of the brightest stars on Egypt’s music scene. Last June, I wrote more extensively about this ensemble when it performed Egypt’s premiere of Beethoven’s Mass in C Majorat the All Saints Cathedral and the Basilique Cathedrale. It was only weeks before the choir won the Silver Diploma in the category of Folklore with Accompaniment, one of the main awards at the ninth World Choir Games, in July. A biennial event which took place between in Sochi, Russia bringing together over 23,000 participants from over 70 countries, the World Choir Games saw the CCC performing Aghani bel Arabi, a programme of songs by the great Egyptian composer Sayed Darwish arranged by Nagui. And what could be more rewarding to the Egyptian listener than the opportunity to attend two award-winning choirs performing side by side in Egypt? 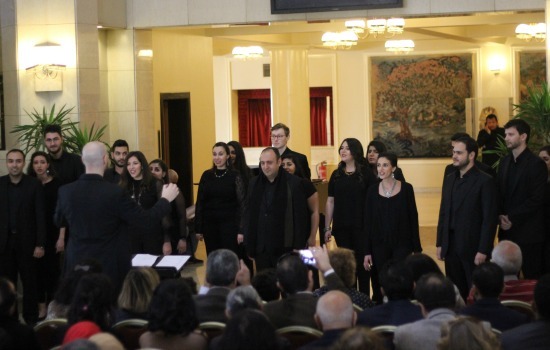 On Friday 3 February, the CCC and Dozan Wa Awtar gave a joint concert at the Cairo Opera House’s lobby, followed by a performance at the Alexandria Opera House on Saturday 4 February. The concerts opened with the CCC performing its Sayed Darwish repertoire (Tel’et Ya Mahla Nourha, Ya Balah Zaghloul, Ana Ra’et Rouhi Fi Bostan, Aho Dah Elli Sar) in addition to a song by Dawoud Hosni and folk compositions, arranged by Nagui, Awatef Abdel Kerim and Gamal Abdel Rahim. The choir was joined by traditional Arabic singer Rehab Metawi, soprano Dina Iskandar and mezzo Jolie Faizy as well as Greig Martin on piano, Ramadan Mansour on tabla and Nashaat Yehia on riq. Aghani bel Arabi is among the most successful repertoire components of the CCC. Not only do listeners in Egypt and the region find it close to their hearts, they also enjoy the arrangement and the choir’s warm delivery, uniformity and precision coming from a 100-strong ensemble. Continuing the evening’s journey through the music of the region, the second segment of the concerts saw Jordan’s Dozan Wa Awtar perform a cappella a selection of folk compositions from the Levant, including a song from the Rahbani Brothers’ repertoire (Zahrat Al Mada’en), finished with a set of well-known traditional Russian songs. Conducted by Nedy Muna, Dozan Wa Awtar came to Egypt with twenty singers, a small part of its much bigger ensemble, but enough to enthral the audience. Their unique and rich in colours a cappella texture shone with beautiful harmonies. To deepen its creative delivery, the choir made a few delicate and humorous theatrical inserts. Among the most remarkable compositions was the choir’s interfaith fusion where the Muslim call to prayer was braided with Christian hymns. No wonder it was received with vigorous applause from the audience, an enthusiasm that extended to the third segment of the performance, when both choirs sang compositions together, from Italian folklore to Sayed Darwish and the Lebanese Zaki Nassif. Nagui considers collaborations one of the most important development strategies for the CCC. “Artistic collaborations introduce the choir to different people and cultures, allow us to explore a variety of techniques, musical material, repertoires. On the other hand they also help to promote our culture to the world. It is a very important experience on both the artistic and human levels,” Nagui comments, adding that prior to the concerts with Dozan wa Awtar, the CCC collaborated with the Les voix du Choeur de Rabat ensemble in Morocco and with the French choir Vittoria d’Ile-de-France in Paris, both in 2014. Muna agrees that collaborations are enriching – equally so for Dozan wa Awtar – as they encourage the members to brave the deep waters of choral music while developing artistic skills. It is worth noting that placing importance on creative collaborations is not the only trait shared by both choirs. During their concert in Cairo, both ensembles projected a great passion for music and art in general. On the other hand, both have very versatile repertoires, performing Arabic as well as Western classical music; they give concerts on a variety of feasts and holidays such as the Christmas time. But, while the CCC stepped into the music scene in 2000, first with their Christmas concerts performed at the Cairo Opera House, Dozan Wa Awtar’s artistic progression has been a slightly different story. Conductor Muna explains that at the core of the choir’s formation was the need to provide a platform of practice for the Dozan wa Awtar Establishment that encourages and promotes – through scoring, publishing and recording – Arabic choral compositions and creates its own original arrangements . “The establishment was founded in 2002 by Shireen Abu-Khader while the choir was born six years later,” Muna clarifies. As the choir gained skill and popularity, its repertoire began to expand and consequently incorporated Western classical music. Muna underlines that it is particularly important for any choir to explore the classical choral works since “they extend the choir’s artistic abilities and work as an essential exercise allowing the ensemble to develop”. The choir’s versatility has enabled the choir to give concerts internationally as well as frequently performing in Jordan and the region. This was the first time for CCC to host international guests in Egypt. Nagui hopes to repeat the concerts in Amman while “our long-term plans include preparation for the next World Choir Games which will take place in 2018 in South Africa,” he says, fully aware that such an endeavour will also require support from many parties. “We have developed a two-year plan during which we will prepare a strong repertoire and hopefully we will be able to travel with a large group,” Nagui concluded.